Kong: Skull Island is dumb, predictable, and often times feels recycled from previous big budget blockbusters. It's also a ton of fun. 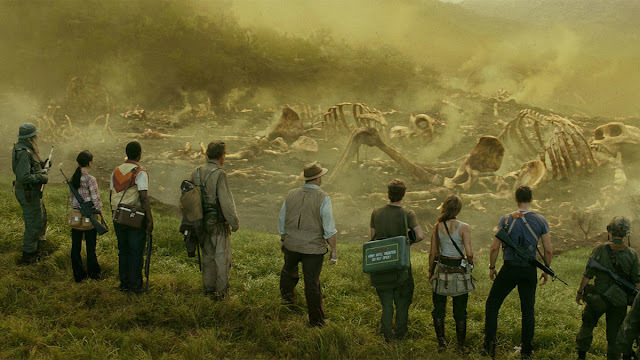 It's impossible not to land on Skull Island and think you are about to embark on a journey through a Jurassic Park sequel, as the mix of characters from military meatheads to fish out of water scientists stranded on a dangerous, isolated island full of creatures feels all too familiar. What Kong does well though to make it stand out from the work that director Jordan Vogt-Roberts and writers Dan Gilroy, Max Borenstein and Derek Connolly clearly ape (pun intended) is their dedication to embracing the time period it takes place in, utilizing a Vietnam war atmosphere and a clear nod to Apocalypse Now to bring some batshit crazy awesome visuals to life, so vibrant and ridiculously cartoonish that it's impossible not to grin. You don't typically buy a ticket to a film like Kong: Skull Island for the performances and that stays true here, although no one is by any means poor in the picture. Lead by Tom Hiddleston and the wonderful Brie Larson, they do what is expected in a movie where the real stars are the action sequences and visual effects, and the supporting performances from brilliant veteran actors like Samuel L. Jackson (although his character is the biggest cliché of the whole movie as he plays military guy who has his own violent agenda on the island that endangers them all) and John Goodman are rock solid but again, you won't walk away from a film like this talking about which actors were the best. You will be talking about Kong and the other creatures and the big, awesome action spectacle moments and the post-credit scene that builds a big monster universe whether you like it or not (I like it). I can understand and appreciate every different opinion imaginable in regards to Kong: Skull Island, ranging from those that believe it is a terrible disaster to those that had an absolute blast with it on the big screen. I could see all the warts while watching and yet I cannot deny I enjoyed the experience, one of those movies I would turn on years from now in the middle of the night when I just want to lay down and look at something pleasing and fun for a couple of hours. Totally agree. Especially when it come to giant monster films, the human characters are never why anyone goes to see this. I loved this movie and saw it twice in theaters. So much fun, but I will say that I thought Sam Jackson's part was a better done of the cliche. I could really see why he'd think and turn like that. I'm pretty sure that Brie and Tom were there purely so that their charaters are now part of the universe and they'll be more important in the sequel (God I hope there's a sequel). Overall, this was what I wanted the movie to be, and I was super pleased that it's one of the few King Kong films that dares to be different. My only confusion for the Godzilla vs King Kong film that will inevitably happen is the timeline. Godzilla first surfaces to the world in present day, while Kong is from the 70s. Glad you loved the film Cody, interesting that I took this damn long to read your comment because now I am able to reflect on the movie rather than base my thoughts on my initial immediate reaction. This one is a blast and yeah, I very much look forward to the next one.